Wow ! What a great school year! 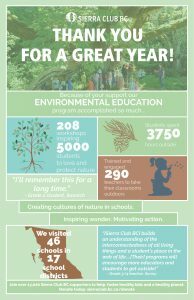 From Quesnel and Victoria to Surrey and Vernon, our Education Team delivered nature education at schools all across the province. 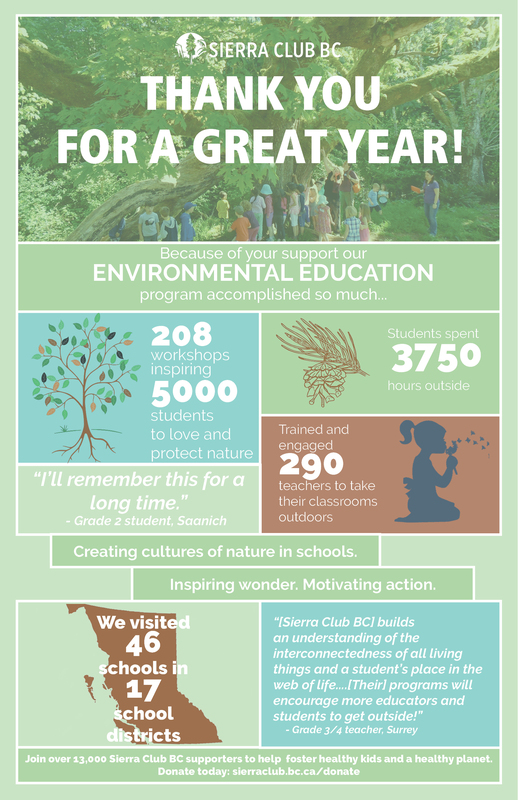 As the school year comes to a close, we are so thankful to all of the students, teachers, school staff, parents, and Sierra Club BC supporters who make this program possible. Together, we are fostering healthier children and a healthier planet. This infographic gives a quick snapshot of the most exciting things you helped us accomplish this year. 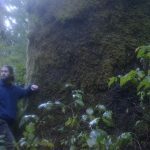 -Making our free, in-class workshops available to more remote and/or underserviced areas of B.C. To do all of this, we need your help. 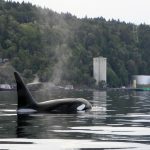 When you donate today, $25 gives a student the chance to connect with nature at their school. $100 helps us travel to a remote community. $250 gives teachers a free workshop in how to integrate nature into their classroom. Information on our workshops for students and teachers for 2016-2017 will be posted in late August. Sign up for our Education E-newsletter to get updates on our programming, and to receive curriculum-linked lesson plans and other nature-education ideas throughout the year. In the meantime, we hope that you will be inspired to get outside with the children and youth in your life, that you will continue to stand up for the places and people you care about, and, quite simply, that you enjoy the summer.